While seemingly simple from the outside, the ear is perhaps one of the most complicated and important parts of the human body. By understanding the major parts, you’ll be able to understand just how important your ears are to your daily life. Sound waves are rapid variations (vibrations) of pressure in air or a liquid. The Outer Ear is the visible part of the organ. Its shape is specially designed to funnel sound. It is made up of three distinct components. The auricle is the piece of cartilage covered by skin that is most visible. The auditory canal is the tube that allows sound to travel inside, and the tympanic membrane (eardrum) is a small layer of skin that is made to vibrate by the sound. The vibrating eardrum causes the ossicles (three tiny bones) to vibrate. The three bones are the malleus (or hammer), which is a long handle attached to the eardrum; the incus (or anvil), which is a bridge bone between the malleus and the stapes; and the stapes (or stirrup), which is the smallest bone in your entire body. The stapes vibrates into the Inner Ear that is filled with a fluid. This vibration causes pressure variations in the fluid in the Inner Ear that are similar to the pressure variations in the sound. 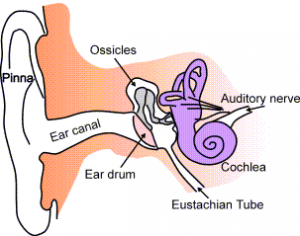 The cochlea is the part of the Inner Ear that is concerned with hearing. The pressure variations in the liquid are analyzed by the cochlea. Special cells in the cochlea excite auditory nerve fibers that carry this information to the brain. The brain converts the information provided by the nerve fibers into the sound we hear. This whole process is constantly occurring throughout the day. The world is full of sound waves, and every part of the ear is required to allow you to hear them normally.